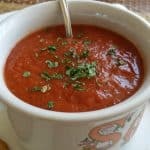 Tomato Soup has always been comfort food at its best. A simple recipe with simple ingredients, completely plant-based, using real, whole foods. Stir in tomatoes with juice, broth, basil, and vinegar.